Dinner kit services are everywhere. It sort of feels like they’re taking over. Food is showing up on our doorsteps, and no one’s going to the grocery store anymore. You’ve seen the ads on Facebook and the commercials on TV: Blue Apron, Plated, Hello Fresh, SunBasket, and the like. Most of them work pretty well for the vegetarian crowd, and I’ve reviewed several on the blog. But now there’s really something to write home about: Purple Carrot dinner kits are exclusively vegan. 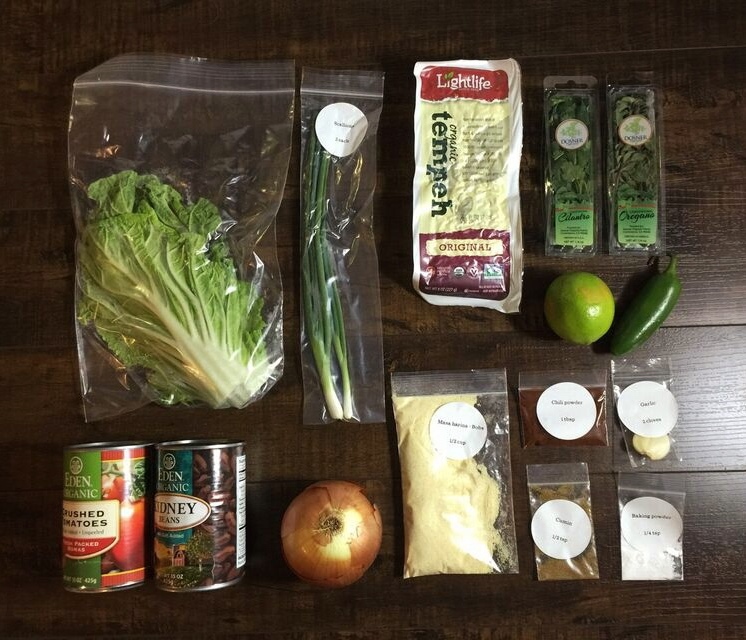 How it works: You sign up for a subscription and they’ll deliver a box of ingredients for vegan dinners every week. They assume you have olive oil or vegetable oil, salt, and pepper but everything else is provided. There is a set menu of 3 meals, with a 4th option you can swap out for one of the default meals if you want. Or if you log in to look at the menu and don’t see anything you like, you can skip or pause deliveries for that week. Otherwise, you don’t choose your weekly menu; Mark Bittman does. That’s kind of their claim to fame. Mark’s a well-known cookbook author and former New York Times food writer who encourages plant-based eating and recently joined forces with Purple Carrot. I think partnerships with celebrity chefs might be on the horizon for the other companies too. 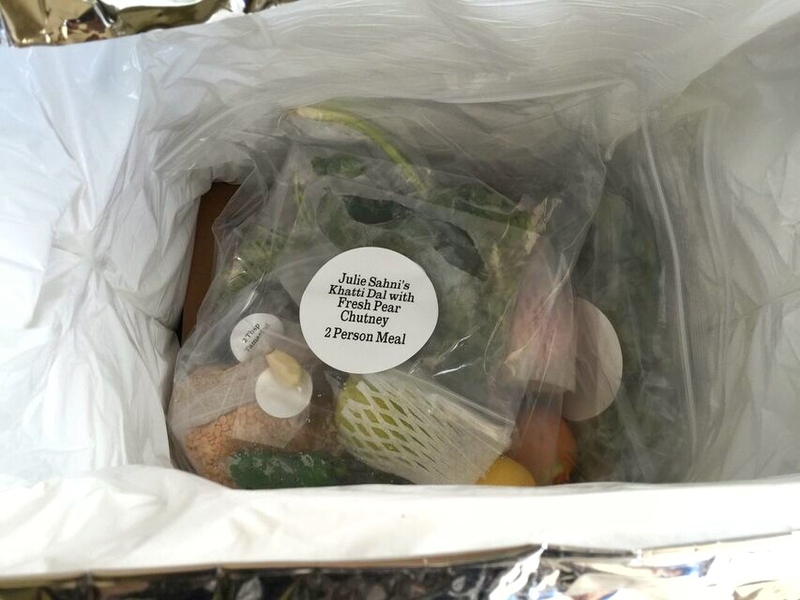 Exhibit A: Hello Fresh is collaborating with Jamie Oliver. 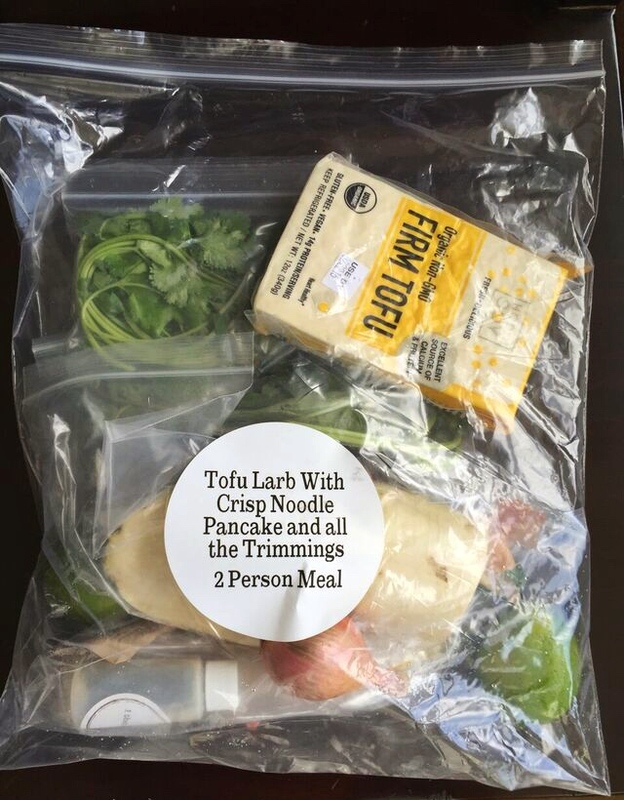 What it costs: $68 for the 2-person box, which has 3 meals per week. (We took advantage of a new customer offer for 50% off, so our first box was $34.) They also offer a 4-person box with 2 meals per week at $74. How hard was it to cook? Not hard. Most of the recipes came together very quickly and used simple, straightforward techniques. 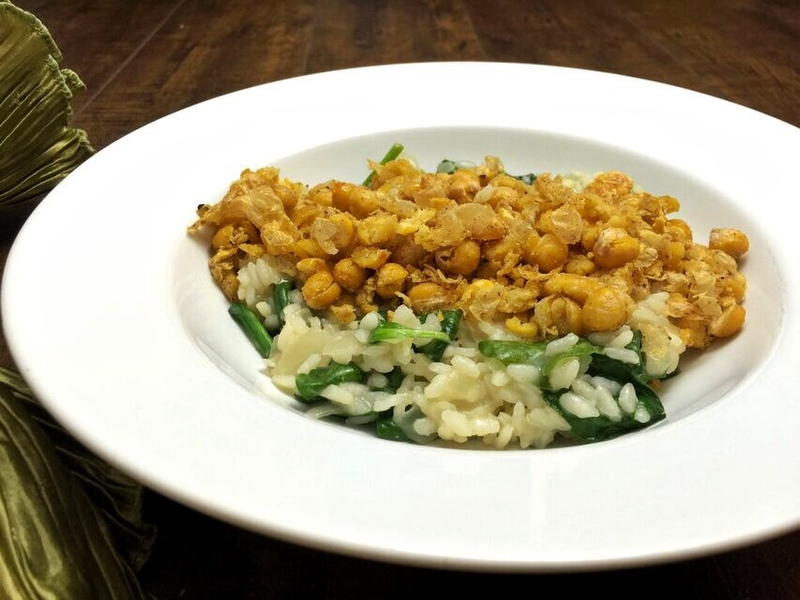 I loved the crispy garbanzos as a protein-rich topper for grains and I will definitely use that again. There were a lot of components for the Tofu Larb meal, but not one that was too challenging. The risotto, chili, and dal were super easy. How does it stack up nutritionally? Great, especially compared to the Standard American Diet. The Cauliflower Romesco lists 13 grams of protein per serving, but besides 1/4 cup almonds there is no concentrated plant protein like beans. You get a few grams from the cauliflower and potatoes of course, but for a main dish I feel like it needs something else. 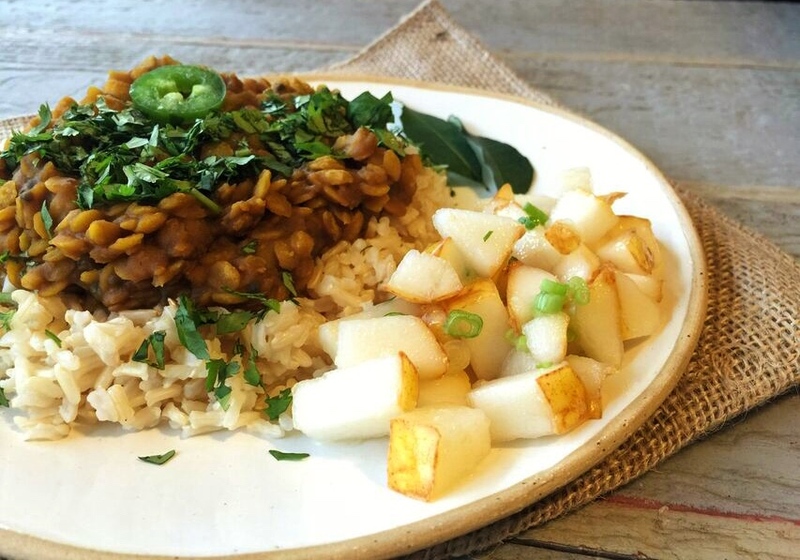 The dal with chutney had a whole grain and a legume and nuts which gets an A+ for nutrient density. The latkes list 18 g of protein but the recipe made 14 of them and “serves 2”, so we’d each have to eat 7 latkes (plus the tofu sour cream) to get the promised amount. 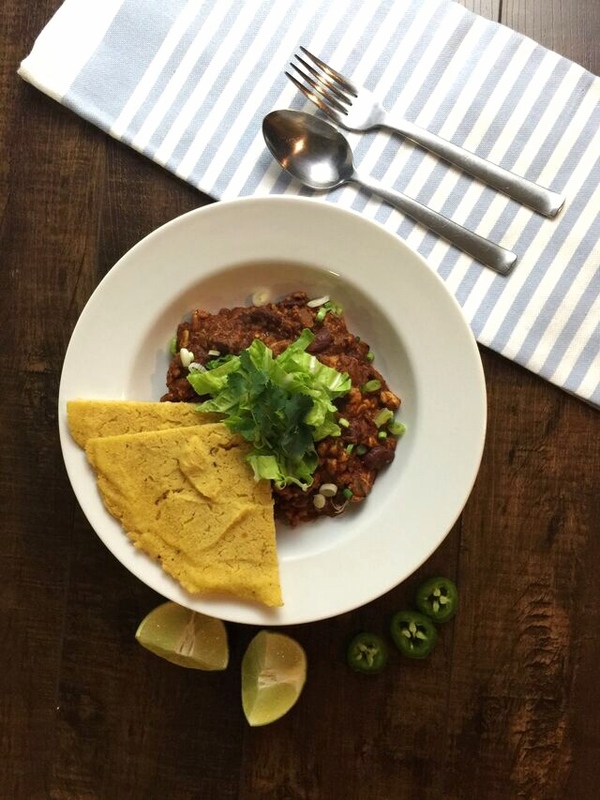 The chili had 41 g per serving, likely because of that protein powerhouse tempeh and the beans. Overall, vegetables were plentiful and calories ranged anywhere from 532-804 per serving. How did it taste? Mostly delicious across the board. The Chili Non Carne was a hit, and definitely the best recipe of the 6. It was genius to top with the nappa cabbage mixture. I never would have thought of that, but the cool, crispness came together nicely with the warm softness of the chili and together they pushed a lot of positive texture buttons for me. 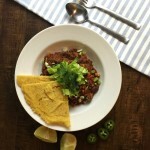 The Masa Flatbread was a quick and easy side dish and a lot simpler to make than cornbread: a batter of masa flour, baking powder, oil, salt, and pepper started on the stovetop and finished in the oven. 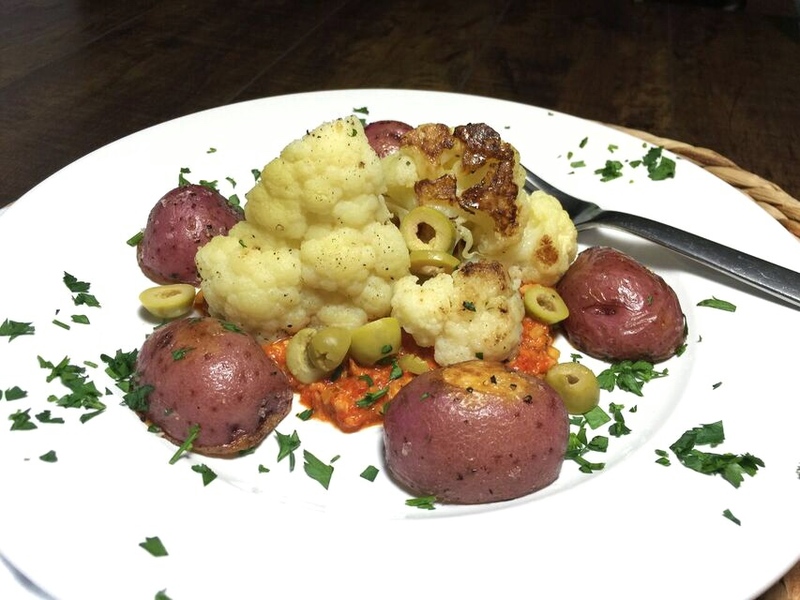 The Cauliflower Romesco was fantastic, and was made with only 10 ingredients. The Spinach Risotto was really good. It wasn’t cheesy like a traditional risotto, but miso added a nice layer of umami flavor in place of Parmesan. 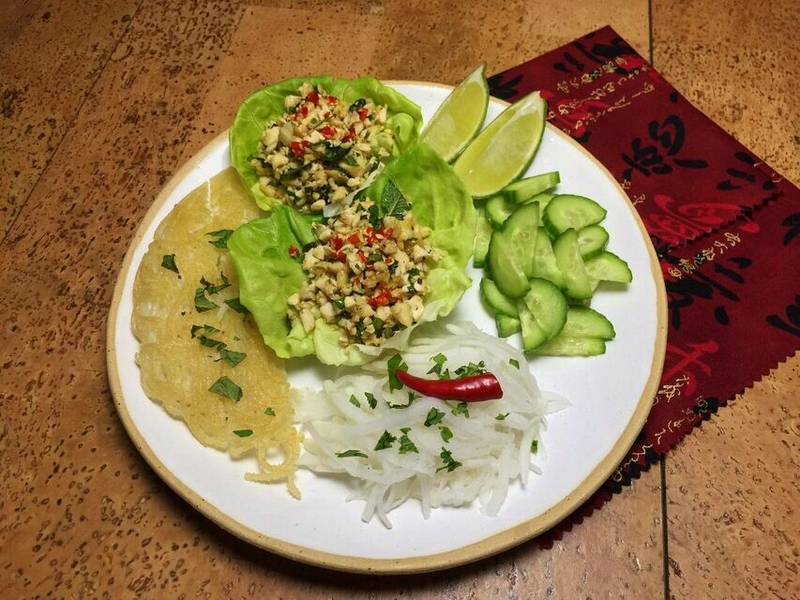 We loved the Tofu Larb which was flavorful on the tongue and beautiful on the plate. The noodle cake was bland on its own but added a great crunch to the lettuce wraps. 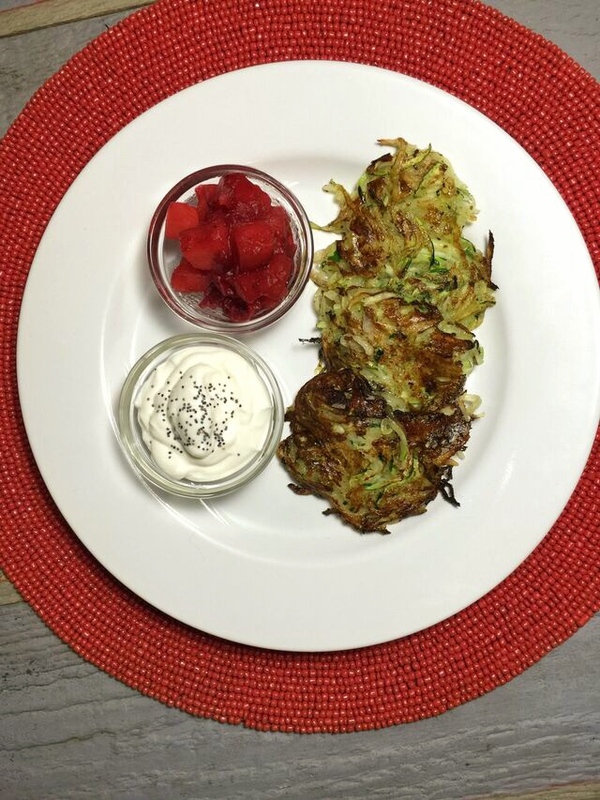 The latkes were our least favorite since they came out sort of wet and bland. Was there enough to eat? Sometimes. There were no leftovers of the romesco, 1 extra serving of the chili, and 1/2 serving of the larb. It really varied from dish to dish. The folks at Purple Carrot are environmentally conscious. They use recyclable plastic baggies, nontoxic ice packs, biodegradable liners, and of course, the box is recyclable. They seem to know that shipping food all over the country has a significant carbon footprint and they’re trying to make smart environmental choices where they can. They’re the only service that’s entirely vegan! Hoo! Ray! TEMPEH! Purple Carrot was responsible for the first appearance of tempeh after 24+ vegetarian boxes of dinner from 4 different companies. 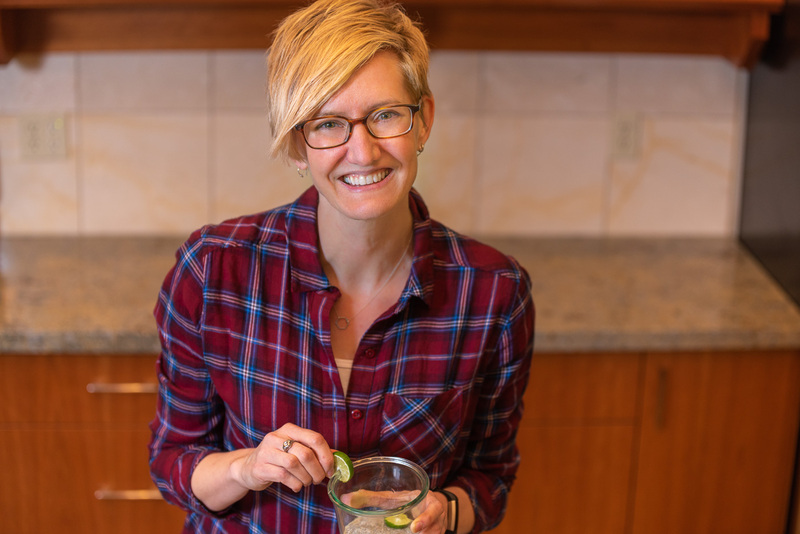 It’s incredibly nutritious, easy to prepare, and tasty, so I’m not sure why it’s underutilized. All ingredients for one recipe are in one clearly labeled bag. Some of the other services just include the entire week’s ingredient all together in the box and you have to sort it out (like regular people do when they get home from the grocery store). But man it’s nice to open the fridge, pull out one bag, and know you’ve got everything you need to start cooking. Besides chili, the recipes had a kind of upscale or fancy presentation. But essentially they were beans and rice, potato pancakes, and roasted vegetables so I think they’d be accessible to most families. The cost per plate is on the high end comparatively at $11.33. Plated tops out the list at $15/plate, while Blue Apron and Hello Fresh are $10/plate. Acme Farms + Kitchen (my local company) is the most reasonable at $7.38/plate. The latke recipe needed silken tofu which got left out of our box and mailed separately a few days later. But we cooked that meal before it arrived so ended up using real sour cream. It wasn’t a big deal, especially since they tried to remedy it as soon as they could. You don’t get to pick, really. So if you have strong food preferences, intolerances, etc. you don’t have a lot of leeway. Here are the swap options we were offered: for week 1 we could have replaced one of our meals with eggplant steaks, or mushroom cakes for week 2. The dinner kit craze shows no sign of slowing down, and now there seems to be a box to fit any family with any eating style. I guess a company like Purple Carrot helps their target audience of plant eaters get dinner ready quickly, but gives everyone else the opportunity to experiment with veganism with a fairly limited commitment and expertly tested recipes. I hope the next step will be even more exclusively vegetarian or vegan companies to choose from so that plant-based diets are more available to the masses. Did I mention you don’t even have to go to the store? Anyone else tried Purple Carrot or another vegetarian/vegan company? Do you think this is a good way for vegetarians to get healthy meals on the table? Looks great. I went to sign up last year, but they weren’t servicing Bellingham at that time. Are they now? The mix and match and ability to substitute sound great. Jamie Oliver is everywhere now. Saw him doing Safeway ads yesterday! Hi Miss Maryanne. Yes, they just recently started delivering to Washington state. I think maybe you were the one who told me about the company in the first place. If so, thank you! I tried it once and it was so expensive I still had to make it and then there was no side to go with it. Or else I had to pay for it. When you go to a restaurant they just don’t give you one dish. I so I plan on making and shopping for my self. It was good and tasty but it wasn’t enough for one meal for two of us. Hi Susan. I agree, we often had to add side dishes which takes away some of the convenience and adds cost. Thanks for taking the time to read the post and share your thoughts! its OK, I love cooking too. But sometimes I do buy vegan meals that are frozen to help us out. Hi Sharon. I agree. We do our own meal planning, grocery shopping, and cooking 90% of the time. But every once in a while, I like to mix things up and try something new just for variety. Thanks for sharing your thoughts! just got my first, and final, order. Challenges with unclear recipe instructions required days and multiple messages just to get what ought to have been simple instructions. Now the package arrives, sans Thai basil..which renders the convenience factor about ZERO for preparing a thai dish. The amount of waste in packaging is difficult to comprehend until one sees it, as is the “devil may care” attitude which appears to have gone into the preparation of packages… plastic bag of kale…torn and thus a combo of spoiled kale and extra plastic. Hi Doug. Well, shoot. I’m so sorry it wasn’t a positive experience for you. I always think it’s good to try new things, so I commend you for trying out the service. Sounds like they really dropped the ball this time. I feel empowered to cook more adventurously now. Hi Christe. I’m so glad you’re enjoying the service. I’ll have to check out the TB plan – that’s new to me.